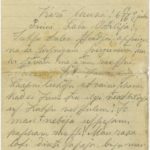 Letter of a Latvian soldier to Otilija Krampe in Valmiera. Letter is sent from positions. Soldier thanks for Otilija's letter. He tells, that was not be able to wrote answer by himself as his hand was wounded. He tells how it happened. Also he excuses that his friends wrote letters to Otilija, as he could not do by himself.